Note: NEW!! – Florida Sales Tax is 7% in Broward County, effective on and after January 1, 2019: Overall Prices Remain the Same, but calculations listed below as to amount included in each Price for Sales Tax to be adjusted accordingly. Please check back for update. 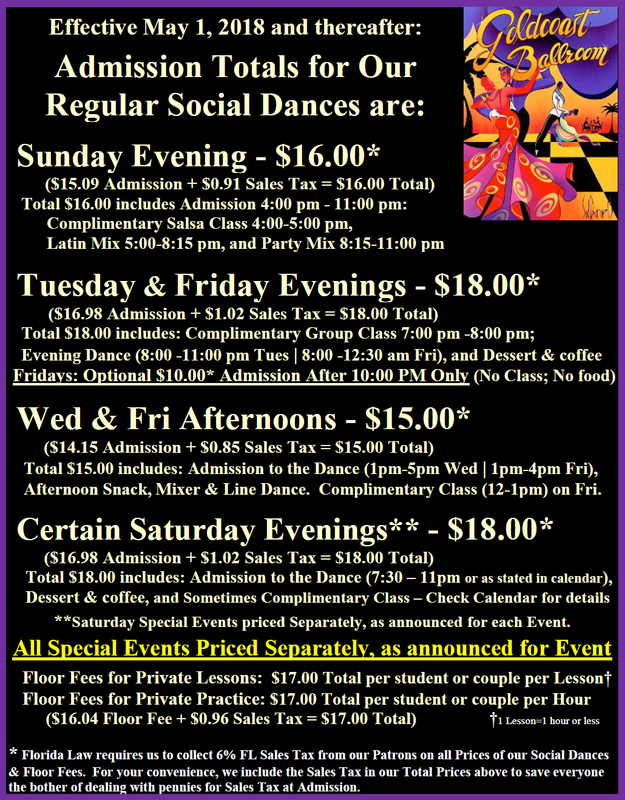 The following Flyer lists our Prices for our Regular Social Dances, Effective since May 1, 2018 (However, Please Note that since September 14, 2018, on Fridays, there is NO optional $10.00 Admission after 10 PM.). As usual, Special Events are priced separately, as announced for the event.